Enamel repair and re-building happens every time a weak solution of fluoride is in contact with damaged tooth enamel. There is no reason to drink fluoride, since the benefits are from the interaction of fluoride with the tooth surface. Toothpaste and rinses offer these benefits without the risks that come from ingesting a toxic kind of fluoride, or too much of it. Most fluoride in tap water is a silico-aluminum fluoride compound, a product of industry that has never been approved by the FDA for human consumption. If someone regularly drinks a lot of water, they may ingest too much of this, and it can concentrate in bones to make them brittle. Fluoride toxicity is a real concern for young children or if you have damaged kidneys or delicate bones. Formula milk has fluoride in the powder and so it should never be mixed with fluoridated tap water. The American Academy of Pediatric Dentistry warns fluoride-free bottled water should always be used to mix formula milk. In the same way, fluoridated toothpaste should not be recommended for small children, since they usually swallow paste. Xylitol granular crystals on a toothbrush would be a much better alternative to toothpaste for young children. (The only time we recommend a tiny amount of fluoridated paste for a young child is if they have cavities). A study from Environmental Health Perspectives in July this year showed ingesting high levels of fluoride may harm children’s brain development. The study was a systematic review and showed children in high fluoride areas had lower IQ scores than peers in low fluoride areas. These studies were in China where fluoride levels are extremely high (as a contaminant from industry). You cannot extrapolate this study to fluoridation in the US, but neither should you believe that a lack of fluoride causes tooth decay. 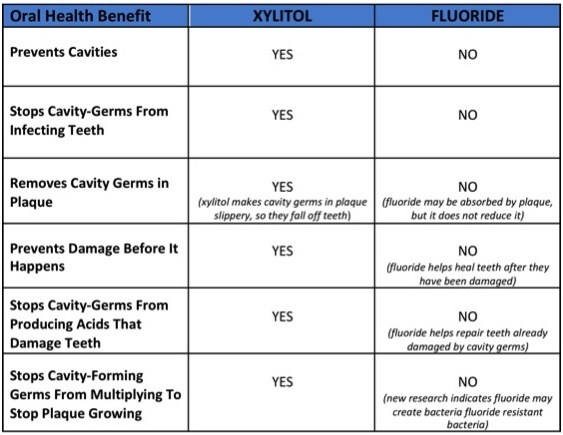 The effect of xylitol and fluoride is synergistic. This means that when you use xylitol it is beneficial, and fluoride can also be beneficial (if you have damaged teeth). When you use these products together for oral health, the effects are greater than you expect by using each product alone. The following picture shows the cavity-healing effects of using both xylitol and fluoride. The complete study from the Journal of Oral Science can be found HERE. One of the conclusions of this specific study showed that remineralization is accelerated when xylitol is used with fluoride. We have a number of articles in the Ultimate Oral Health blog that talk about how to best use xylitol for oral health. Here are some quick tips as well as some links to past articles. Zellies can help prevent cavities in adult teeth. Eat Zellies Mints or Gum after meals, snacks or drinks as all their new teeth erupt. Remember best results are seen when you have at least 5 exposures to xylitol throughout the day, with a total amount of 5-10 grams per day. For more information on fluoride, click HERE to read the chapter dedicated to this topic in Dr. Ellie’s book “Kiss Your Dentist Goodbye“. ‹ Change Your pH and Improve Your Teeth and Gums! There are lots of misconceptions about xylitol, even by dentists and doctors. Xylitol is often confused with “artificial sweeteners” and xylitol could not be more opposite from an artificial sweetener! In cheap commercial products xylitol is mixed with artificial sweeteners because xylitol is expensive and sorbitol, mannitol, and Splenda (sucralose) are cheap. In Europe, for example, Wrigleys makes a pure xylitol gum, but in the U.S. their chewing gum is mainly sorbitol, advertised as “with xylitol”. “Ideal Xylitol” is a granular brand advertised as “mostly xylitol” but when you look you will see xylitol is being mixed with cheaper six carbon sugar alcohols and that 10% by weight is Splenda! I mention this, because this trickery is confusing and many people have bad stomach problems from sorbitol, mannitol and artificial sweeteners – yet blame xylitol. They get gas and bloating etc. from these horrible ingredients mixed in with xylitol. Splenda changes the pH of the gut and can damage gut bacteria. There are lots of problems with these other products that are often mixed with xylitol. You must look for pure 100% xylitol – like Zellies. Pure xylitol does not upset the gut, but actually makes the gut healthier! Xylitol breaks to a short chain fatty acid – butyrate – which helps repair the gut lining. Some people, with poor gut health, can have loose stools as they first use substantial quantities of xylitol. Xylitol pulls water to itself ( hygroscopic) and especially those with a weak gut lining will experience water in their gut – which loosens stools. The secret for these people is to start slowly. I suggest a small amount ( like one Zellies mint) after meals, then gradually increase as the gut lining heals. thank-you for your response. I will slowly introduce xylitol into my 5 year old sons regimen. I guess I should bring him to dentist and see what stage his pain in his teeth are at before I move on to the whole protocol of closysis Listerine crest and act rinse. Even if his first teeth have problems I want to concentrate on laying the preventative foundation for the permanents. Would you have any input on how the fluoride affects the teeths ability to remineralize when you add fat soluble vit like k2 d3 and A in food forms ex. ( fermented cod liver oil, high mineral supplement )? I would assume these nutrients help the saliva to rebuild the teeth. You say to only use bottled water for formula, what about BPA leeching into the water from the plastic? I am more concerned about that than flouride. Mixing formula milk powder with fluoridated water will give an infant too much fluoride – and this may have developmental effects on teeth and possibly other areas of the child’s body. I agree BPA is another big concern, which is why we need to prevent children from ever needing a filling or sealant. You may want to find out if your local water supply is fluoridated or not – and campaign to get fluoride out of your drinking water ( or you may be lucky and live in a non-fluoridated area). 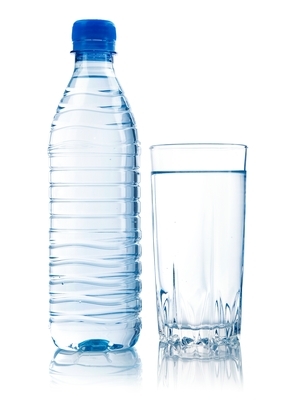 Today some companies offer non-fluoridated water in glass or non-BPA containers, although this may be more costly and only available through stores like Whole Foods. I always suggest if you use formula milk, you should do everything to mix it with the healthiest water available. Most of all we must realize that putting fluoride in water damages teeth of many infants in poor families, since many do not understand this danger exists and do not have resources to buy good water for their infants. in the long run even a counter top Reverse Osmosis(RO) unit is cheaper than filling jugs at whole foods or the like… my local super market offers 39 cent per gallon refills of bring your own jug. I once figured out that even at 39 cents a gallon a $300 counter top RO unit pays for itself with in 7 months if you exclusively use RO water for cooking and drinking. It would be so nice if we could get fluoride and crazy stuff out of our drinking water. I sat for three hours last week to try and swing the vote for the removal of artificial fluoride from Austin Texas’ water supply. Austin has wonderful ground water – it is alkaline and has naturally occurring fluoride at 3 ppm – which is just about perfect water. Why do they have to mess with this and add toxic waste……it is really time for us to stop fluoridation of water in the US. Can a mother to be rid her body of this bacteria so she does not pass it to her UN- born child??? If you were my daughter and let’s suppose you had unfilled cavities and gum disease. The first thing I would do is have you begin to use the Complete Mouth Care System, try to keep drinks and meals to mealtimes as much as possible – and end every meal with either a piece of Zellie’s gum or a couple of Zellie’s mints. Obviously the less sugar your consume, the better – but you would soon notice improvements in your mouth health – just limiting sugar to meal times, and also using xylitol frequently after meals – eating a small amount preferably 5 or 6 times a day. This is certainly the easiest and probably the very best way to improve your family’s oral health – I hope you will give it consideration! Will the complete mouth care system still work? Absolutely if these are permanent teeth and if you follow the directions and give this system about 6-9 months. I would like to know more – for example the age of the child and why you think cavities started. If the child is a mouth breather – maybe you need a xylitol nasal spray. What have you been using for oral care products? Also is there a family history of bad teeth – and are you all prepared to start using the system? It is essential to limit drinks to mealtimes ( and really limit sodas, juices and drinks that are acidic and sugary). Xylitol must be taken after every drink and snack – at least 5 times a day. You will need your child to get on board with this program and help to remind him/her that before bed and in the morning – teeth must be helped – with appropriate care. I am so grateful for your reply. My daughter is 12 , has 9 cavities , of which 2 are interproximal After reading the info on your website, I have a feeling the lack of fluoride could have caused the cavities. She used to use Euthymol .. toothpaste which contains glycerin and no fluoride. Another reason for the cavities could have been due to a poor diet. She used to eat a lot of junk food from Burger King etc.. Her lunch box used to be full of junk food as well..
All the above also applies to 14 year old who has 7 cavities. I have been told that the cavities are small; yet the dentist wanted to put fillings in! You are a breathe of fresh air. Is it okay for them to drink water between meal or should that be limited to when they eat? When we limit the number of times we eat or drink each day – we limit the number of acidic attacks that damage teeth. Adding xylitol at the end of every meal or snack is another way to limit this damage. If you can stop snacking on sugars and carbohydrates – or snack on gluten-free products, this will also limit damage. It’s important to limit damage, but we must also increase protection/help for teeth. We can do this by selecting good home care products which “strengthen” teeth. This is best done at times when the benefits will continue for at least half an hour – preferably longer (which is why “preparing teeth” before sleeping is so valuable). Good oral care products encourage minerals to be attracted to teeth – so they are adsorbed onto the tooth surface ( where they harden and mineralize enamel).The minerals are naturally present in saliva. Some products prevent or disrupt this transfer – which is why I do not recommend many oral care products! You ask about drinking between meals. Undiluted saliva helps harden teeth – so it is good for teeth to be in contact with saliva for at least a few hours each day. Saliva varies in its mineral content during the day and night. This is called a circadian rhythm. After lunch appears to be when saliva is most mineral-rich. This is why it is good not to eat or drink for a few hours after lunch – to allow the minerals from saliva to go into teeth. Hope this explains! After reading the info on your website, I have a feeling the lack of fluoride could have caused the cavities. She used to use Euthymol .. toothpaste which contains glycerin and no fluoride. Another reason for the cavities could have been due to a poor diet. She used to eat a lot of junk food from Burger King etc.. Her lunch box used to be full of junk food as well..
All the above also applies to 14 year old who has 7 cavities. I have been told that the cavities are small; yet the dentist wanted to put fillings in! I’ve been following your protocol for a few months and am very happy that I learned about it. My 15 y old son was to the dentist about 3 months ago, and they found a cavity. We could see a dark brown mark on his molar. We started the program, and gradually the brownish turned lighter and smaller and smaller. But it seems on the side of his tooth (further out than his brown mark) there is a crack. He has been very good with the xylitol and rinses, but for about 2-3 weeks we got some mints that didn’t have only xylitol while waiting for new xylitol mints since it’s difficult to find her and must be ordered. The dark spots gone must be a good sign and means it’s working, right? I’m just worried that his cavity/crack can get worse. Can he follow the protocol for some more time before checking? I read some place that if we follow the protocol it will anyway halt the cavity? Mouth health is a balance between damage and repair. We need to ensure that there is always more repair than damage. If you can increase the use of the Complete Mouth Care System to three times a day – that may be enough to tip this balance on the side of repair – sufficiently to give him a clean bill of health at his next dental visit! I’m just wondering if I should add some xylitol to my ACT Fluoride rinse and if so how much per bottle? Would it be more effective if I’m not cognizant of eating xylitol after meals? I have no problem, but my kids and husband never bother. I think that is a good idea and should work fine! In Europe they have mouth wash like ACT but it contains xylitol.